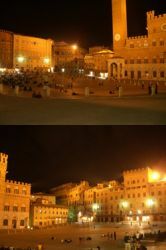 Siena has to be one of the most beautiful places I have ever seen! Arriving in Siena was like stepping into a time-machine then exiting it into this amazing place where the streets are cobbled, the town is still surrounded by a fortressed wall, everyone still walks everywhere, there are no cars, no pollution, only the smells of delicious food and the gorgeous rolling Tuscan hills on every side… I’d half expected a horse drawn cart to clip-clop around the corner carrying hay! Yet, the awesome thing is, Siena still has everything you need. You can totally lose yourself in the winding medieval streets, the unspoilt views over the countryside, and the relaxed pace of life, but then pop into the internet café on the corner to chat on gmail with friends at home. I could spend an afternoon soaking up the sunshine out on the roof terrace of the historic building of the Italian school where I studied, wander out to meet a friend for a slice of Panforte made from a centuries old recipe and then grab a coca-cola and watch a game of football on television at one of the local bars. Ha ha, just like John Mortimer wrote in the novel Summer’s Lease; Siena has “all the delights of the Middle Ages without the stink and the fear of plague.”! Dripping with history, you could be mistaken for thinking you have taken a trip back in time to a medieval city when visiting Siena! Legend has it that Senius, son of Remus, who was in turn the brother of Romulus, founded Siena. With the first settlements in 900 to 400 BC and the cathedral being built in the 1100s you cannot fail to be impressed by the history of this fascinating city. Shaped like a medieval Roman amphitheatre, the Piazza del Campo is regarded as one of the most beautiful public spaces in Europe. Unmissable in the centre of the city you have to make your way down one of the many steps and alleyways that lead to it. At night you can buy ice cream at one of the ‘Gelaterias’ before entering the square. Alternatively, for a little more money there are many competing restaurants with front row seats surrounding the square.